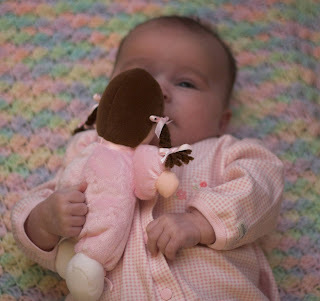 This is Eleanor with her dolly that she just absolutely adores. Okay, she doesn't absolutely adore it yet, but I'm working on it. I think it's so cute when little kids carry around something special everywhere they go, so I'm starting a bond between Eleanor and this doll. I give it to her (lay it on top of her- whatever) when I'm changing her diaper, when we're in the car, etc. I do not give it to her at night or for naps because if you know me, you know I am a total freak about my child suffocating herself. (One of many things I'm a total freak about; others include a deer running in front of my car, robbers hiding under my car in a parking lot- this list is really long.) When we first brought Eleanor home, I was thinking of ways to remove her arms (just at night) because she kept putting the darn things up by her face. I tried to tell you- total freak. I'm hoping when Eleanor gets bigger, she will name the doll. If she named it right now, it would forever be called "Goooooooo", and that's not a very good name, is it? She will love the dolly before you know it! Grace has a little blankie (16x20) that she now HAS to have when she is sleepy. It is so cute though! Oh and you will loosen up about the blankies and stuff in her crib. You will go into her room one morning and her face will be pressed against the bumper... you will totally freak! I DID! But you realize there isn't anything you can do about it.